Most people deal with all sorts of problems throughout the course of their lives. Depending on the person and the type of problem, these problems can usually be worked through with relative ease. Some problems, however, aren't so easy to work through, and they make it hard to function in everyday life. These can include emotional problems, cognitive, developmental and social problems, as well as physical addiction. Overcoming severe forms of these problems will often require professional help and guidance. 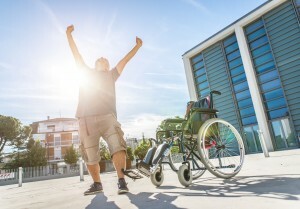 Rehabilitation psychology is a branch of psychology that focuses on treating individuals dealing with disabilities and problems that make living normal lives difficult. Professionals in this field try to help people with these types of problems adjust and work toward leading happy and healthy lives. This area of psychology involves treating a broad range of problems. Some of the problems that rehabilitation psychologists treat may be mental or emotional, and they may include such things as depression, anxiety, developmental disabilities, and learning disabilities. Other problems that rehabilitation psychologists treat might be physical, such as addiction or chronic pain. Problems that rehabilitation psychologists treat might be chronic or acute, and they might also be congenital or acquired. Division 22 of the American Psychological Association, the rehabilitation psychology division, was founded in 1958. Two years later, in 1960, Beatrice Wright published Physical Disability: A Psychosocial Approach, which is considered today to be one of the first and most influential books written in the area of rehabilitation psychology. Today, the field of rehabilitation psychology continues to grow. Rehabilitation psychology careers are highly sought after, especially considering that people are starting to realize even more the importance of rehabilitation. Why Do We Need Rehabilitation Psychology? Imagine living your life with an illness or disability that you can't control, or imagine that your loved one had an illness or disability that made living life difficult. Imagine how agonizing it would be, how helpless you would feel. Rehabilitation psychology can help with some of these problems. Professionals in this field can help some individuals deal with and eliminate their problems, and get back on track with their lives. Patients who enlist the help of rehabilitation will often learn to make better choices and adapt to new challenges that they may face. The answer to the question of why we need rehabilitation psychology is simple. Everyone deserves a chance at a normal, happy life, and rehabilitation psychologists can work to help some people achieve this. What Does a Rehabilitation Psychologist Do? Rehabilitation psychology is a very broad area of psychology, and it covers a wide range of different psychological problems. Many rehabilitation psychologists specialize in certain areas of this field, and they only work with certain types of patients. These professionals must also take into account that all patients are different, and what works for one may not necessarily work for another. Despite these facts, there are a few common duties that a rehabilitation psychologist might have. Rehabilitation psychologists are often responsible for assessing their patients to determine what is wrong with them. This usually involves observing their behaviors, interviewing them, and possibly interviewing their loved ones. If the situation warrants it, loved ones might also ask a rehabilitation psychologist to help with staging an intervention. An intervention is a process used to intervene in a patient's life to stop him from participating in harmful behavior. Interventions are particular common in cases of addiction. After assessing and diagnosing a patient, a rehabilitation psychologist is also usually responsible for recommending a course of treatment. In most cases, these psychologists will be able to help the patients. Treatment often includes different types of therapy, including one-on-one therapy, group therapy, and family therapy. During therapy sessions, a rehabilitation psychologist will usually lend a compassionate and non-judgmental ear. He will also help his patient and guide him toward overcoming future hurdles in life and become more self-reliant. Rehabilitation, however, is not something that can be accomplished solely by the psychologist and the patient. It is a team effort. These professionals will often help their patients discover and set up a support network of trusted family and friends that have the patients' best interests in mind. Support networks such as these are excellent for when patients are feeling discouraged or even hopeless in their progress. Where Do Rehabilitation Psychologists Work? Rehabilitation psychologists might work in a number of different health facilities. This can include hospitals, physical therapy centers, long-term care centers, drug and alcohol rehabilitation centers, psychiatric hospitals, and mental health clinics. These professionals might also be employed by halfway houses, detention centers, and social service offices. Some rehabilitation psychologists also choose to open their own practices. What Are the Education Requirements to Become a Rehabilitation Psychologist? Individuals interested in a rehabilitation psychology career should start with a bachelor's degree in general psychology, clinical psychology, or counseling psychology. Students should also try to minor in rehabilitation psychology or rehabilitation counseling. The courses that aspiring rehabilitation psychologists should take will generally depend on their preferred are of specialty. Those interested in becoming substance abuse rehabilitation psychologists, for example, should take courses on addiction and substance abuse. Graduate degrees are also usually required to start rehabilitation psychology careers. Many psychology schools offer graduate degree programs in rehabilitation psychology. Graduate students are often required to conduct original research in this field and defend that research, as well as complete an internship. In order to finish you education and become a Rehabilitation Psychologist you will need to finish you education with a doctoral degree program. Learn more about rehabilitation degree programs online. What Is the Median Salary for a Rehabilitation Psychologist? Where a rehabilitation psychologist works and his experience in the field will often have an impact on how much he makes. According to the Bureau of Labor Statistics, for instance, psychologists who worked in substance abuse facilities in 2010 earned a median annual salary of $69,150. Those who worked in physicians' offices, on the other hand, earned a median annual salary of $109,600 in that same year. Beatrice Wright published one of the first books on the subject of rehabilitation psychology, titled Physical Disability: A Psychosocial Approach. This book is considered to be one of the most influential books in this field.